The Bible clearly shows us that the “church” is not a structure or building but rather a body of believers. Hebrews 10:25 says, “Let us not give up meeting together, as some are in the habit of doing, but let us encourage one another.” This Bible verse emphasizes the fact that followers of Jesus must regularly meet together. The local church is typically where this type of meeting will occur. So the church (body of believers) is very important to the life of a Christian. So choosing a church is one of the most important decisions that one can make in his/her life…maybe only second behind choosing a spouse to marry. Your church, in many ways, helps to shape who you are and your relationship with God. Many of the things you will learn about the Bible will come through your church. This decision is not one to make flippantly or without putting much thought into it. The choice is important and the options are many. Some recent statistics show that there are approximately 450,000 churches in the United States of America. Even in a small town one will often have six or seven choices within a few minutes of home. So where do we begin? How do I choose? I am going to go through some things that are important about picking a church. These will include things to look for and also things to avoid. However, keep in mind that our number one resource for every decision in life is to turn to God and the leading of the Holy Spirit for any decision that we will make in life. I encourage you to pray and to look to God for wisdom and leading in this all-important choice. Is the Bible the main resource for preaching and teaching in the church? Does the church believe that the Bible is the inspired and inerrant word of God and is the final authority on every church matter? Every church should encourage you to worship God. Worship isn’t just about sitting through a worship service or singing songs. At the core of worship is an intimate communication with God. The church must help you in this connection with God not only with the weekly Sunday Service but throughout your life. A disciple is one who is learning to live like Christ. A healthy church is just as concerned with growing members than with growing numbers. Growth is a sign of life in a church. God is glorified by growing churches. That growth does not just mean numerically but through people growing as evidenced in serving, or by getting involved in missions, or by giving financially (maybe for the first time), by sharing the gospel with others…and the list goes on and on. Sound doctrine is important. Most churches will have a doctrinal statement posted on their website. Carefully look over this and see if it agrees with Scripture and hopefully what you believe too. A good doctrinal statement will explain their positions on at least these topics; the Trinity (God the Father, God the Son, and God the Holy Spirit), salvation, sin, human destiny, the Bible, and the church. True Christian Fellowship is not just pot-luck meals and times of social gatherings. These type of fun events can often lead to fellowship but don’t underestimate the importance of fellowship. Consider these two verses. Hebrews 10:24: And let us consider how we may spur one another on toward love and good deeds. 1 Peter 4:10: Each one should use whatever gift he has received to serve others, faithfully administering God’s grace in its various forms. While Jesus was walking on this planet he also showed the importance of fellowship. He invested his life into the twelve disciples and when He sent them out, He sent them out in two’s. We need encouragement, support, correction, and guidance from other believers for us to grow the way God wants us to grow. This type of preaching believes in our earlier point of the authority of Scripture. This is the oldest preaching style around but it never goes out of style. The goal of this preaching is to expound on what is said in a particular passage of Scripture and to carefully explaining the meaning and applying it to the congregation. The expositional preacher’s authority begins and ends with Scripture. Sound expositional preaching is often the catalyst of growth in a church. Pray for your pastor that he will commit himself to the study of Scripture, carefully and earnestly, and that God will lead him in applying the message of the text to his own life first and then to the body of the church. We can see this element clearly in the beginning with the Reformation. Martin Luther was earnestly seeking to understand Scripture and what he was hearing taught and preached did not match up to the words that he was reading in the Scripture. We too, must be committed to be men and women of the Word of God. This topic may be covered at least partially under the category of doctrine but I believe it is so important that it needs special mention. The view that a church takes about evangelism and salvation is so important. A simple definition of evangelism is to present the good news of Jesus freely and trusting God to “convert” people (see Acts 16:14). One of the primary callings of the church is to proclaim the good news of Jesus Christ so that those who believe it already might be encouraged and so that those who don’t believe might have a chance to do so. Every single Christian church should preach the gospel regularly and faithfully. This is not an exhaustive list but 7 things that I believe should be considered when choosing a church. I once had a great seminary professor that warned us young pastors in training of this…he said, “Don’t look for a perfect church. Because if it is, it won’t be after you get there.” We all laughed but he was so right. There is no perfect church but there are some things that are so important in finding the right one for you. Very good article Daryl. I like your writing style and look forward to reading more. My favorite excerpt from this one is “Today’s culture wants religious tolerance where all views are okay but that is not what the Bible teaches.” You hit the nail on the head! Preachers are preaching to itching ears … it is a sign of the times. Thank you for boldly pointing out some great things to look for when choosing a church. Well done! I am honored to be writing along side another godly man. Thanks for the welcome Pam. It is good to be part of a great team of writers. Blessings to you and your family. Excellent work Daryl. You are spot on the mark here my friend. I think that having a Christ-centered, Bible-believing church is the true mark of a good church. The final point is especially important in of that evangelism. I totally concur. Please allow me to extend a warm welcome to this site my friend. I look forward with eager expectation to future works from you my friend. I am so pleased to have you here. Thanks Jack. Josh has told me about you and your ministry. I believe in the inspired Word of God and that it still changes lives. Too many ‘sermons’ are given as morality talks without leaning on the power of the Holy Spirit and the words of God. Thanks for the kind words and it is good to be a part of the team here. the bible says be not like thse who love to pray on street corners and in the synagoges for they love to be seen by others . I’ve already chosen a church, but my mother won’t drive me till we move. It’s a little ways out, and she doesn’t want to waist gas money. I was brought up a strict Roman Catholic,and boy was it strict. I was living in terror. My nerves were that bad i got Alopecia.When we went to confession we always went to the good priest,but one day the other one came out of his confessional,and he said i want half of you down hear. I went in,and if they had special effects like today i think it would make evan the devil repent.In all that time you thought we have got the Pope,and they were working in the background,and so you had a ticket to heaven. That all changed about a year ago,because something profound happened to me. I researched the Catholic Church very throughly,and i did not like in what i came up with. It was very disturbing. The Holy Spirit changed me. I will sum it up this way if Jesus came down in jeans,and top,and he was to go inside the Vatican,Jesus would say like he did to the Sanhedrin inside their temple. Then Jesus would be arrested,and Jesus would end up on a section in a mental hospital.How very true your title his,which church? I am new to computers, so forgive my errors. Also am having my 77th birthday in a few days. I want prayer for my 49 yr old son, who is in need of salvation. He won’t listen to me and because he is unsaved….he whole little family is also unsaved. please pray for his salvation….I’ve prayed for him for many years already……but he refuses to come to the Lord. I don`t go to church because of a mental health problem,and i can`t get my shopping in. This effects my personal hygiene. In America religion is flourishing in Europe it is declining fast because of the life style of today. In England religion is no longer taught in schools,and evan Sunday schools have vanished. I too have a son,and told him,but he does not accept God. He was brought up a Roman Catholic,and he said that it is a load of bull. Sorry but i can not find the words to continue any further? Dear Mr Cotton, I was so sorry to hear of your childhood experience as a Roman Catholic, I myself am a Catholic and have met so many good, bible-believing people in this church. It also does so much good worldwide, with missions, hospitals and poverty relief, but the recent scandals of the clergy and the Vatican seem a long way from our everyday experience! I think it is a tragedy that people’s childhood experiences can put them off the faith, when God is a God of love and truth. I pray that your mental health will improve and that your son will find his way back to the faith. Never give up hope! God bless. Thanks for your kind words Carolyn. It wasn`t just in my childhood,it continued up till about 2yrs ago. Then something profound happened to me. I was sitting on the couch when something happened. What i was saying wasn`t me. I was talking like somebody who studied the bible. God opened my eyes,and i could see,and understand what was happening. It was an amazing thing,and then i knew it was the Holy Spirit. Then i researched all about the Catholic Church. Through history the Catholic Church has murdered more people than any other religion. I learnt about these Anti-Popes,and that the Vatican has Assassins to murder people today. They also have a network of police. I could not believe what i found out.You said recent scandals. They are not recent they have been going on for years,right back to the first Pope(Not St Peter) In the bible it does not mention that Peter was in Rome at all. They have changed the Commandments,and worship Idols. Bishop Josip Strossmayer questioned the Popes infallibility in Vatican I in 1870,but later on he recanted. I wonder why? Sorry about rambling on. I could write a small book in what they have done,and failed to do what was right. What church do you attend. Has i mentioned i am mentally housebound,and i feel guilty about not attending a bible teaching church. Jack said something about a lone ranger,and you have to find one,but when i explained my situation he apologised,but there was no need for an apology because he did not know about my condition. Don`t get me wrong there are some wonderful people in the Catholic Church,but they do not know what is going on. Sorry again Carolyn,and your words of concern. I will stop now. After reading your comments I think you are going through a tough time. But I am being compelled to give you a bit of consolation, although I have not been going through what you have experienced, and there might be something happening recently. In this blog there is a recent article named ‘How To Live A Life Of Contentment: 7 Christian Tips’, which states the necessity of aligning our attitude to God and possibly forgiving other people. I know this is more easily said than done, but from the perspective of a third party, I would encourage you to read more articles, either from this blog or by someone you believe to be guided by the Holy Spirit, that clarifies what the Bible really teaches and how a Christian life should be like, instead of just what they think the Bible teaches and what mistakes someone else has committed. Regarding your request of finding a good church and concern for denomination and stuff, I believe God is on the way to help you and give the solution you need. It would be helpful if you could narrow down to some specific obstacles, so that it would be easier for other people to help you. Thanks for noticing my comments Fred. Has you know i used to be a RC,but something profound happened a couple of years ago. God opened my eyes,and I believe the Holy Spirit led me hear. I find it hard to believe that God can just forgive me for my sins(Doubting Thomas)the hardest part is to be sincere,and i don`t feel sincere. This makes me have a debate with God. Also i don`t read the bible,because i find i just read a paragraph,and then i don`t know what it means,and give up. I told Jack about finding a layman from a church,and he said that`s a great idea,but alas no answer yet. It`s also very hard when you live by yourself. I know what you are trying to say,but i can`t express myself in writing to you.I have a tumour on my left cheek,and i am in and out of hospital. Now i am going off the subject. I would be glad if you gave me a couple of examples of the specific obstacles that you have mentioned. God must have sent you Fred. Hello, dear friend! Do not be sorry for anything. All, I confirm: ALL catholic religion is a satanic invention! you can not go to God praying to anybody but Christ. I know what you mean. I asked my son about taken religion,but he said Dad it`s all made up,and it`s not my scene. I don`t think it would be his seen if he saw a vision from Hell. blog posts. Any way I will be subscribing for your feeds and even I achievement you get admission to persistently quickly. God bless you and praise God for sending the message through you to so many people. I had been confused for years about what I should do and what part of the Bible I should read and your articles really brought me closer to Jesus and has kept me closer to the Lord than I have ever been in my life. I can feel him working in my life and with each day it gets more exciting because I stay in the word and I can feel him more than the day before. I will keep you and your family in my prayers. I found a site called http://www.remnant of God.org I watched a video about the Sabbath,and the narrator used bible quotes from the beginning to the end to prove that we should be keeping the Sabbath. I could not find one error throughout the video. God made the Sabbath. At the beginning he said God said “Remember”,because we have forgotten it. Jesus taught on the Sabbath. The Apostles taught on the Sabbath. St Paul evan on his travels made it a point to teach on the Sabbath. He said from the beginning of the bible to the end you will not find one passage where it mention`s Sunday. Man changed the Sabbath to Sunday not God. The video is under Sabbath. I must stress I agreed with the video,and it was all took from the bible. It evan said quotes and answers like you Jack. Anthony, I do know that Jesus spoke about every commandment in the New Testament except the Sabbath one. Was it coincidence that He left this one out? He asked the young, rich ruler about how he could enter eternal life and Jesus went over some of the commandments but never did He teach the Sabbath as required. He even did things that were to be stoned for on the Sabbath, like picking corn in the field with His disciples. Jesus say obey My commandments…which two were the greatest? Love the Lord your God and love your neighbor as Himself. Why did He leave out the Sabbath, and so did ALL the apostles? Just me thinking out loud. Thats what the guy said on the website picking corn from a field. He said Jesus was lord of the sabbath,and he did not teach the way the jews taught on the sabbath. That`s why Jesus told them off. He more or less said the same things you have said. He also issued a challenge to prove that the first day of the week(Sunday)is no where mentioned in the bible has the sabbath. Jesus did talk about the sabbath in the New Testament when he told the pharisee if a sheep fell down a hole on the sabbath you would pull it out. That`s when he said the sabbath was made for man not man for the sabbath. The word Sunday came from pagan origin,and I know it did,because the catholic church is full of pagan signs. I cannot fault you on your comments either Jack. This is the dilemma I am faced with when two scholar`s of the bible use the quotes in the bible to put their point across. From what he said and you I cannot find a fault. I will ask God to make me see. Once again thank you Anthony. Yes, Sunday’s name came from that pagan source but so is a wedding ring a pagan symbol but does this mean we are pagans for wearing them? No. Also, Saturday comes from the god Saturn and is named in honor of this mythological god. Now, if Jesus condemned the pharisees about not wanting to even pull out an animal on the Sabbath, does this mean that we are to not do good on the Sabbath, which ever day we observe it? Yes, the Sabbath was made for man which means we are to rest on one day a week. There is no evidence anywhere in the New Testament that Jesus kept or observed the Sabbath and that is the bottom line my friend. The bible record is clear that the apostles worshiped on the sabbath day and taught others to do the same. The women who followed Jesus kept the sabbath on the seventh day(Luke 23:56) Paul kept the sabbath while carrying the gospels to the gentiles(Acts 16:13.17:2.18:4) This is the evidence that Jesus kept the sabbath. One big difference he did not keep the jews sabbath He kept the Lords sabbath. You wrote a big list on a post on how the jews kept the sabbath like lighting a fire. Jesus did not want this kind of sabbath to way us down with all these stupid rules and laws. In history the Emperor Constantine ordered it to be kept on Sunday. Remember thou keep holy the sabbath day. Has for all your other comments you are right because I have read them in the bible about what St Paul says,and your other comments. I was answering to your main question at the end of your post,and it`s all in the bible. Thank you Anthony. I am done with this topic as it turned into a debate and I already have far too many to count and I do not like to do this. I guess I and most of the churches are wrong and are sinning you must believe. It has been nice commenting to you. Good bye sir and may God richly bless your Sabbath keeping. You have definitely misunderstood me I was making a point between the Lords sabbath,and the Jews Sabbath. It`s not the first time you have misunderstood me. I am not implying that at all,and you go on to say may God richly bless your Sabbath keeping. I am not Sabbath keeping has well and i have never said I am going to keep the Sabbath. I was pointing out merely what the bible said. You are a bible believing man so the quotes I wrote down you don`t believe them. May God give you the wisdom to understand the quotes. I will leave has I came. I am very lost. I am 18 years old and was not raised in any religion. I was touched by the Holy Spirit about a year and a half ago. I have prayed each and every day since then in many meanings. Forgiveness, thankfulness, hope, strength, you name it. My relationship with The Lord is so significant in my life. Every day I try to allow him to work through me, using my strengths! I never thought I could be so grateful for my life and every blessing I am given each day. I read daily devotionals for inspiration and new ways to communicate. I want to attend church now. But where? Which church? There are so many different ones? Reformed? Alliance? Baptist? Calvary? Lutheran? Presbyterian? I do not even know what these words mean. I am working my way through the Bible, but am having a hard time on my own. I want to learn His word, I want to meet others who worship. Is there such a thing as a simple standard church? Please help me, I am clueless. All I know is what I live for, why I am here and who I lean on. When I research I do not know what I am looking for, if any of you think you can specifically help me… I live in Aldergrove BC Canada. Megan, I am encouraged that you want to find a good church home. After reading this article and then checking out the next link which is an article that says How to Find a Bible-Believing Church? I think you will be able to look for what defines a good and godly church. Here is also a link that reveals which churches are in your city and you can click the various links to the churches and see what their beliefs are and what they focus on. You may have to attend for awhile to be able to discern which is best for you. Please let us know if or when you do find a good church home Megan. I was wondering how your search went and if you were able to find a Christian Church in your area? Keep up the fight. Peggy, don’t lose heart. Besides the good advice shared here by many, the Holy Spirit Himself will lead you. Do not fear, just rest in Him! Every church should encourage you to worship god. This is a key point for me. 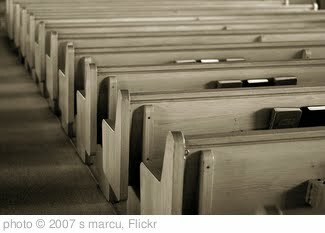 What is the point of attending a church if you are not there to worship? If you just want to socialize there are a lot of other places you can go to do that. These are all awesome tips for choosing a church. I’ve been meaning to get in touch with my spiritual side for quite some time now. I really like what the article said about choosing a church that encourages you to grow. I feel like, for me, the point of religion is helping me to grow in ways I otherwise wouldn’t be able to. Thank you Lisa for the encouragement. Our church is so small but we are so very close. There is something special about smaller churches, not that bigger ones are not good but we all know each other and are devoted to praying for one another. Last week, we spent much of our time praying during Sunday school and I love that. Informative article indeed. all good churches must include these 7 attributes i suppose. Thank you for your kind words sir. My wife and I just moved to a new area and are searching for a good christian church to attend. I like that you said no church is perfect, but there are certainly characteristics that we can look for. We especially want to raise our kids in a good church. Thanks for the ideas! My husband and I are trying to find a church to join so that our family can be closer to each other. Thanks for the advice about finding a church that has a sound doctrine that agrees with the scriptures. Hopefully, we can find a church and have our family draw closer together. Thank you Mrs. Smith. May God help you find that church and may He also bless your family richly. I really appreciate all of these different things to look for when choosing a church. I agree that the place you choose should encourage you to worship God. Like you mention, worship isn’t just about sitting through a worship service or singing songs, the center is the communication with God. My husband and I have been searching for a church to go to, and it is important for us to find one that brings us closer to his spirit.